It is hard to believe that so close to Orlando’s urban jungle you can find such untamed wilderness, beaches left to turtles and crabs, ancient dunes protected by boardwalks, and unique wildlife. 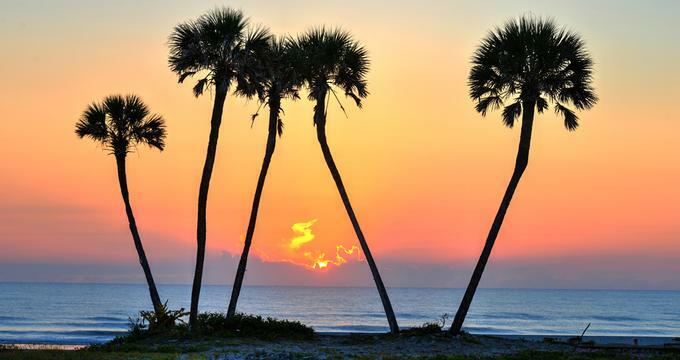 There are Florida beaches with all the amenities, lifeguards, and rentals, as well as quiet, pristine spots with some of the most beautiful sunsets in Florida. Here are the best beaches near Orlando, Florida. With NASCAR, the LPGA, the Daytona International Speedway, more than 50 art, music, and other unique pop culture festivals throughout the year, and 23 miles of sandy, white beaches, Daytona Beach is the ultimate family vacation place. As far as Orlando beaches go, this is a great choice for the closest beach to Orlando. There are ten well-maintained beachfront parks promising endless oceanfront fun with picnic areas, splash parks, pavilions, restrooms, playgrounds, and boardwalks for fishing. Some of the most popular parks are Lighthouse Point Park and Smyrna Dunes Park on Ponce Inlet with 125 acres of space for swimming, walking, running, or just soaking in the sun. Check out 40-acre long Ormond Beach in Michael Crotty Bicentennial Park, which is popular with more athletic visitors with areas for football, basketball, baseball, soccer, volleyball, and tennis. 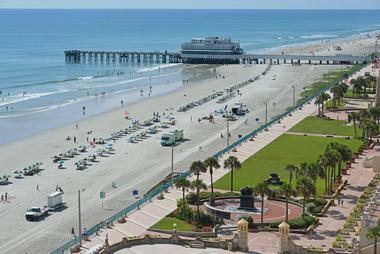 Next read: 15 Best Things to Do in Daytona Beach. Cocoa Beach is your quintessential beach town; it is relaxed, always sunny. If you are looking for the closest beach to Orlando, this spot is conveniently located only an hour drive from Orlando in the middle of Florida’s magnificent Space Coast. The entire area is one endless beach with 72 miles of Atlantic shoreline covered in golden powdery sand just off spectacular waves. Alan Shephard Park is the best beach for you if you like to have everything handy, from restaurants and great shopping to lifeguards and picnic areas with tables. The famous Ron Jon surf shop is within walking distance away. Lori Wilson Park is a family beach that is less crowded and free of charge. If you like to fish, Port Canaveral Jetty Park is ideal for you. This beach is also great for bird watching. Cocoa Beach Pier is the place where you can watch the surfers do their thing, have a drink, or just people-watch. Continue reading below for more Orlando, Florida beaches. Keep reading for the closest beach to Orlando. Located in the Gulf of Mexico across St. Joseph and north of Clearwater Beach, Caladesi Island is one of the last truly natural islands on Florida´s Gulf Coast. Caladesi´s white sand beaches are among the most magnificent in the country. They are perfect for swimming, beachcombing, sunbathing, and surf fishing. The three mile long nature trail offers nature lovers the opportunity to spot wildlife while hiking through the interior of the island. Paddling a kayak trail through the bay and mangroves is another way to see the wild side of Florida. There are picnic tables, shelters and picnic pavilions, and a marina with water and electric hookups. The park can be reached by boat or by ferry, which leaves from Honeymoon Island State Park. Close to Cape Canaveral, you can lie on the beach and watch a rocket shoot into space on one side and turtles lay eggs on another. Canaveral National Seashore is located on a barrier island along Florida's Central East Coast between New Smyrna Beach and Cape Canaveral. There are 23 miles of pristine beaches and no cars roaring down the beach, no towering condos, no surf shops, no beach motels, and no lights; it is the last of Florida’s coastal wilderness. Some of the best beaches of the Canaveral National Seashore are Apollo, Klondike, and Playalinda, with endless ocean, rough seas, and boardwalked dunes covered with palmettos and sea oats. Even with no shops, games, or lounge chairs, the beaches are popular and can get crowded. You can swim, sunbath, snorkel, surf, or fish, or you can watch rockets take off from the Kennedy Space Center launch pads. At night, you can join rangers at the Merritt Island National Wildlife Refuge and go see sea turtles lay hundreds of eggs in the sandy nest. You can also look for endangered wildlife – 13 species such as peregrine falcons, bald eagles, and manatees live in the Seashore. Things to Do in Cape Canaveral Find more ideas for the closest beach to Orlando below. Located between Daytona Beach and St Augustine on Florida’s Atlantic Coast, Flagler Beach has 6 miles of quiet beaches with not many crowds but a lot of what Florida is all about – warm water, golden sands, and endless ocean views. There are charming beachside shops, authentic waterfront restaurants, excellent fishing from the pier, great surfing, great local musicians, and fun rooftop bars and restaurants with views to die for. Set on a barrier island along Florida's Space Coast beside the Indian River Lagoon, Melbourne offers miles and miles of unspoiled beaches, surfing, fishing and snorkeling, and frequent light tropical breezes. Of many local beach parks, three are the most popular. One is Sebastian Inlet State Park with sensational surfing, emerald clear waters, three miles of fine golden sand, great scuba diving, boating, and fishing. Coconut Point is a popular nesting site for sea turtles, but it is also great for swimming and surfing. Juan Ponce de León landing is a beachside park where the famous explorer allegedly landed in 1513. Quaint and historic downtown Melbourne is full of charming shops and restaurants. Keep reading for the closest beach to Kissimmee. Located on a barrier island in the Gulf of Mexico not far from St. Petersburg, Treasure Island is Old Florida, with three miles of white sandy beaches bordered by the Treasure Island Beach Trail great for magnificent walks along the ocean and the ancient dunes. A quiet, laid-back atmosphere, warm gentle waters, and peaceful beaches make Treasure Island a perfect destination for families. Let the kids swim, snorkel, and build sand castles without having to deal with hordes of tourists. The convenient Beach Trolley takes locals and visitors from beach to beach and to restaurants and shops nearby. You can organize a deep-water fishing trip in one of the shops in town. Located on the Gulf of Mexico on the west central coast of Florida in Pinellas County, Clearwater’s beach has been recognized for years as one of the most beautiful in the country. This stretch of bright white sand is miles long and lined with swaying palm trees. It also has a famous Beachside Promenade with meticulous landscaping and artistic details. You can bike or walk along the promenade and watch sun worshippers enjoying 361 days of sun every year and take in the view of the clear, turquoise waters stretching for miles to the horizon. There is a full time lifeguard and a swim zone restricted to 300 feet, so kids can swim safely without worrying about boats and skiers. Things to Do in Clearwater or Keep reading for the closest beach to Kissimmee and Orlando. Located not far from St. Petersburg, Fort De Soto is the biggest park in the Pinellas County. It stretches over 1,136 acres on five interconnected keys. It is full of palm hammocks, beach plants, mangroves, hardwoods, wetlands, and rich native plants. Each of them is crucial for the preservation of Florida’s natural environment. The park is home to more than 328 species of birds and refuge to the loggerhead turtles, which nest from April to September. To really explore the park and its many trails, rent a kayak, canoe, or bike. You can also fish from a pier or visit the historic Fort de Soto made of the coquina shells and its mortar battery cannons. The views from the fort are spectacular. Located with the Atlantic Ocean to the east and on the central east coast of Florida an hour’s scenic drive from Orlando, New Smyrna Beach is the smaller and quieter cousin of Daytona Beach boasting the quaint feel of a sleepy historic town. Its wide beach has hard-packed white sand, and driving is permitted in designated areas. On the beach near the boardwalk and its rides and arcades, Daytona Beach Bandshell has free summer concerts every year. Nor far from the beach is Daytona Lagoon Water Park, which has waterslides, go-karts, laser tag, and much else. The beach is almost completely undeveloped, but it is popular among surfers and has been named one of the 20 best surfing beaches in the world.